The Tyler Hill Alumni Day was a wonderful success. Many alumni young and old came to THC on Sunday, July 27th to join us for our annual Hall of Fame ceremony. The day began with alumni touring the grounds, renewing friendship and making new ones along the way. Everyone was thrilled with the way Tyler Hill looked. A delicious barbecue was held. Eric Roth was the M. C. and inductees Michael Nyman, Richard “Grandpa” Goldstein, Gary Futterman, Nancy Roth, Jennifer Jasper, Martin Adams, Jody Abbey, and Robert Ehrlich reminisced about their days here at Tyler Hill. Lisa Jame, another inductee was unable to attend. “Fut” donated basketballs to camp in honor of Shelley Schneider and Stuie Witner, two of his counselors who made his days at camp memorable. He also presented Paul Sundick with a plaque honoring Sy, Sundick, Girls’ Head Counselor for 25 years, who brought the Hatchet Hunt to Tyler Hill in the ‘60’s. 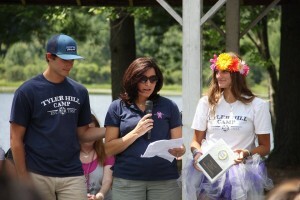 Lee Horowitz, and Arielle Geller were recognized and talked about their role former roles at THC. The key word here was “Lucky” and how lucky they were to experience Tyler Hill and how lucky our campers should feel to be here today. Current Tyler Hill family member Marni Zuckerman was introduced by Andy and she spoke about her wonderful experiences here for her and her 3 children. Debbie Engelhardt was introduced by her oldest daughter Ryan and made a list of what are the most important things at Tyler Hill. Finally, the surprise of the day: an extra plaque in the box: WENDY SIEGEL!!!!! Bette read a Starfish acrostic all about what she brings to all of us at camp. Chris spoke about what she has brought to boy’s side. Michael talked about her impact on him and Deanna and Andy also told about her history here. The whole camp sang “My Girl” and in the chorus we substituted “Wendy” for the lyric “My Girl”. Wendy was surprised and grateful for this well-deserved honor. This wonderful event ended with the alumni on the stage leading all the campers in the Tyler Hill Alma Maters.